Rishi Nairain, former Asian Games gold medallist and now organiser of mega golf events, has always loved golf. So, here was an easy question to ask him: explain the magic behind the appeal of golf? a�?There are two things: for most achievers who have succeeded in their careers, golf teaches self-mastery. Second, therea��s the tremendous camaraderie the sport brings.a�? For the Etihad Pro-Am competition, being played on May 31, alongside the Louis Philippe Cup (June 1-4) at the KGA, a whole bunch of celebrities will be teeing off on the golf course. This includes ex-cricketers Kapil Dev (a long-time golf lover), Ajit Agarkar and Murali Karthik, former athelete Ashwini Nachappa, film director Mani Ratnam, stand-up comedian Papa CJ and many more. Ita��s pretty much the same thing everywhere you look. According to Narain, a�?Internationally, golf is a favourite with the likes of basketball stars, Michael Jordan and current NBA star, Stephen Curry, tennis legend Ivan Lendl, A�film stars Pierce Brosnan, Michael Douglas and Will Smith, and of course, cricketers like Ricky Ponting, Jacques Kallis, and Brian Lara, who are virtually good enough to go pro! Ita��s something about the solitude of the game and a way to get away from it all that attracts them. Even current India captain, MS Dhoni, seems to have gotten hooked to golf in the past year and Sachin Tendulkar is busy trying to achieve some level of competence before making an appearance in public.a�? Kapil Dev echoed his views. He took up golf to get away from crazy fandom and ended up just loving it, he says. a�?On the course, no one would disturb me, or ask for photos or autographs. Then, I started enjoying the challenges of the game and that got me hookeda�?. Agarkar, another ex-cricketer, began as a fan of golfdoma��s biggies. a�?Ia��d follow Tiger Woods, and now my current favourite, world No 3, Rory McIlroy of Ireland. I thought hitting a stationary ball would be easy but ita��s really difficult to keep your shots straight.a�? Golfa��s big prize money is naturally a big draw for young sportspeople. 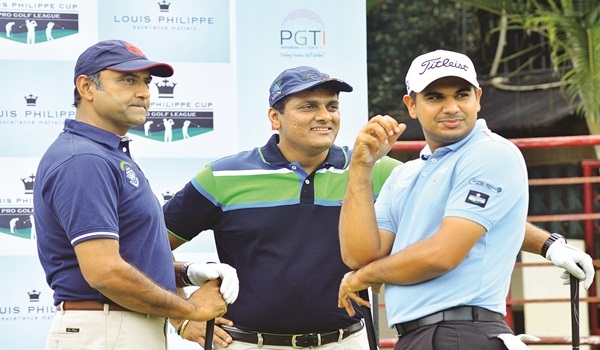 The Louis Philippe Cup, for instance, offers Rs 1.2 crore as prize money a�� no small amount. Golf is also gathering steam as a spectator sport, and our own Anirban Lahiri (currently world no 56) is pitching hard for a shiny medal in the Olympics, which he believes would help the sport get more sponsors and attention in India. Ultimately, those who play it do it for the love of the game. As in Mani Ratnama��s case. He says, a�?Golf speaks an international language. Unlike cricket, golf is played in over 200 countries. Wherever I travel in the world, I make instant friends through a game of golf. The bond created between fellow players after just one game cannot be matched in any other sport.a�? That seems par for the course.